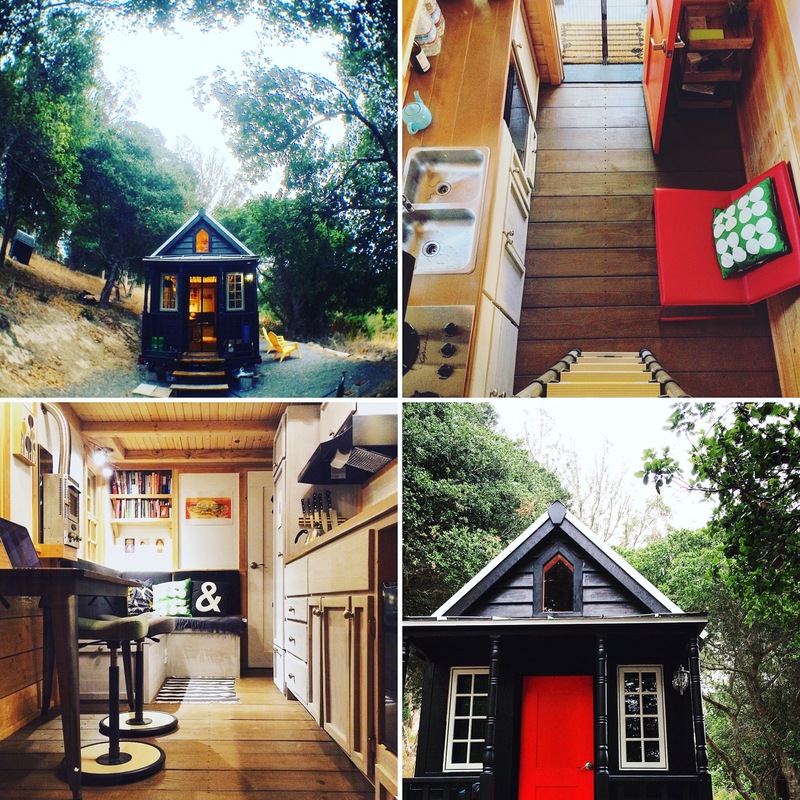 Our tiny house is nearly finished, so I wanted to share a preliminary tour on my other blog. I mentioned recently, in my Things I Like list, that 1), I like to name inanimate objects and 2), my husband and I have an imaginary friend named Leavenworth. (Don’t ask why, as I don’t quite know how this all came about.) It’s only natural, then, that we name this house, and that Little Leavenworth will be its name. If you’re interested, take a peek at the house, which should be finished this week. It’s been a year-and-a-half since I first wrote about moving out of San Francisco, wanting to make changes in my life, and moving toward living in a smaller, simpler space. I feel like I’ve been taking baby steps since, but am now excited that the house is almost done, and we’ll be able to move in later this month. I’m also not sure how our tiny house blog will evolve — I realize I’d rather use this blog to write about living in the house (and just filing these posts in the Tiny Thoughts category), so Tiny House Travelers may become more of a static site with galleries and a video tour of some sort. I also don’t think Tiny House Travelers is the most appropriate name; I refer to “travel” in a very different sense, so it might be misleading to visitors who expect us to be changing locations regularly. As usual, things are up in the air — once we’re settled in the house, I’ll have a better idea of how best to document our experiences. Check out the house tour on Tiny Notes. OMG, Cheri, I can’t believe you are a tiny house officianodo. I am obsessed with them. My husband isn’t interested at all so I will have to wait until I’m a widow, or dead. Looking forward to reading more about this. Years ago I lived in a tiny cabin, and when I got old I knew what I needed/wanted was once again a tiny space. In this case a small townhouse. A great decision. Your place looks just grand! Thanks! More recent updates are on my other blog, if interested. The interior is slowly coming along. I long to live in a tiny house someday and have started putting plans in place for how to make it happen. Good luck with your new little house. Good luck with it – so far it looks gorgeous ❤ 🙂 !!! I look forward to hearing more about your new journey! All the best! This looks great! The name sounds perfect for you guys, too. Wishing you guys all the best! Yep, super tiny 🙂 I’ve been inside a number of houses that are less than 100 sq ft, but I don’t think I could do that with two people! Cheri, Wow, looks like it’s all coming together. The inside is looking very cool. Love the brick. And the open shelves, but I’m worried about that shelving (when you move from spot to spot)? I guess you just pack it up? You’ll maybe only have two of everything, not like a set of 8? Yeah, anything that is “loose” would be secured or packed up before we moved the house. Since we don’t plan to move it often (once a year? maybe even less if we decide to stay put somewhere? ), I’m not worried about this. We purged our kitchen cabinets (and every other room in our previous home) before we put our things in storage so that we’d only have two or four sets of things. We also donated about 75-80% of our belongings and furniture, so we don’t have much. We’ll purge again in the coming weeks, as it’s pretty crazy how much you can accumulate in just a year! Congratulations your new home looks fantastic! I so want to move into one of these little homes with my books and my tea and a blanket and just escape the world for a week!! Absolutely gorgeous!! Does the house move around with you? You can read more about our plans on our About page. I love the interpretation you’ve attached to this––tiny house travelers. Doubtless it will provide you many things to share and your readers much to enjoy and learn. So you’re making a home in the world: a profound activity. May your home shelter you and enliven the folks in your community.